The ObjexxFCL is an open source C++11 library that provides Fortran-compatible array, string, formatted i/o, and intrinsic function support for Fortran-to-C++ migrations and some additional components and capabilities to support reengineering and modernization of technical C++ applications. 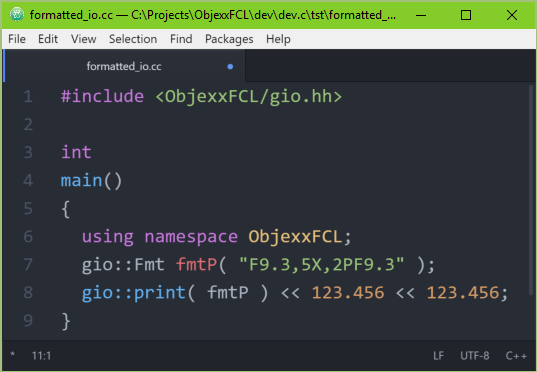 The core components of the ObjexxFCL provide the array, string, and intrinsic function support for Objexx Fortran-to-C++ conversions and Fortran—C++ integration. Each dimension can have an arbitrary index range. Column major element ordering: Nested loops ordered to provide efficient contiguous element access are still efficient in the C++. Array passing "tricks": Arrays and array elements can be passed to functions where they are declared with a different rank or dimensions. "Member" array usage for arrays of user-defined types. Characters are indexed starting from 1. Trailing space ignored by comparison operations. The ObjexxFCL has an elegant Fortran-compatible formatted i/o system that works within C++ stream-based i/o and provides both very complete Fortran formatting support and excellent integration with native C++ stream i/o. The byte type is a C++ equivalent of Fortran's INTEGER*1. The ObjexxFCL provides wide coverage of Fortran 77-2008 intrinsic functions. The ObjexxFCL contains components that support the evolution of technical applications after conversion from Fortran to C++ or as part of a modernization process. There are also components and functions that provide useful services for technical computing that C++ and its standard library are missing. 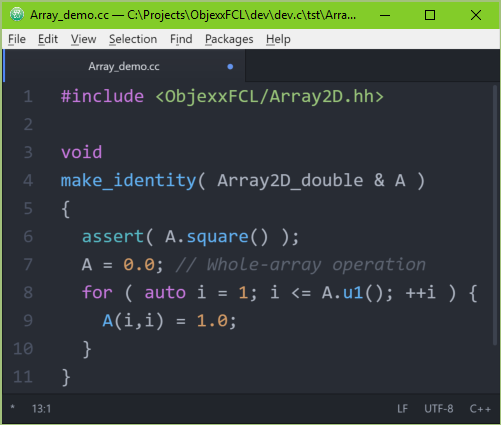 Technical applications often depend on fast, safe arrays and the ObjexxFCL provides some powerful array support, such as the ability to migrate to dynamic array sizing via explicit calls or a decentralized automatic mechanism for the common situation where the sizes for different parts of the array dimensions are determined in locations scattered throughout the code. Full bounds checking in debug builds. Initializer functions (more powerful than DATA statements). Move and swap operations for efficiency. Linear index subscripting for fast inner loop operations. Row-major version of the arrays (and a process for converting code to row-major). Automatic dynamic allocation and sizing via Dimension objects. Optional memory-aligned array data for vectorization. Optional proxy array const-correctness checking. ChunkVector is similar in interface to std::vector but uses multiple contiguous "chunks" of user-specified size to avoid allocation failures for very large vectors in a fragmented memory environment and to greatly reduce the performance cost of resizing operations. In typical use there is no performance degradation for ChunkVector element access compared to std::vector. These are lightweight wrappers around C-style arrays and strings that catch memory errors such as leaks and buffer overflows. This allows the safe use of functions requiring those C-style types. Vector2, Vector3, and Vector4 are fast, loop-free 2, 3, and 4 element vector class templates that can give technical applications a big performance boost over arrays. The Vectors provide a set of fast operations such as magnitude, normalization, distance, min/max, and dot and cross products. The Vector types interoperate with std::vector, std::array, and the ObjexxFCL Arrays. The byte and ubyte types are signed and unsigned single byte numeric types. Beyond emulating Fortran's INTEGER*1 the byte types support C++ bit operations and avoid unwanted conversions to/from the char type. In addition to the Fortran intrinsic support there are numeric, string, and character functions that extend and fill holes in the C++ standard library. The ObjexxFCL is included with our Fortran-to-C++ conversion projects and can be licensed separately. The ObjexxFCL is provided in C++ source form with a perpetual, royalty-free license that allows client modification. The ObjexxFCL is written in ISO Standard C++11 and is known to be compatible with the current releases of the major C++11 compilers and should be compatible with all standard compliant C++11 compilers. Contact Objexx for current ObjexxFCL licensing information.